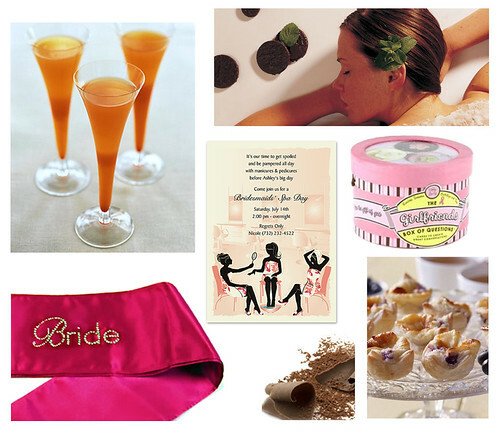 If you’re a bridesmaid planning a friend’s bachelorette party, consider making it a full-day event. The stress of planning a wedding can lead to undue anxiety the day prior to the ceremony and later result in a bridezilla moment. Keep your bride blissful by surrounding her with her best gal pals and planning activities that are both fun and relaxing. Muffins & Mimosas -- 9 a.m.
For a fun wedding twist, consider serving “passion” fruit mimosas and these blueberry lemon kisses from the Perfect Bite Co. (available from Saks Fifth Avenue). Passion fruit mimosa recipe available from Martha Stewart. Spa Treatments –- 11 a.m. Many spas have special packages designed for the wedding party and during the Holiday season, you may be able to to take advantage of seasonal treatments like this peppermint pattie salt scrub from Hershey’s Chocolate World Spa. Dinner & Drinks –- 7 p.m.
Take along this girlfriends box of questions from Sweet and Sassy for interesting table talk. Club Hopping –- 9 p.m.
A sash, tiara or veil is a must for the bride-to-be. This pink sash is available from the Bachelorette Superstore.